Scientists at a new interdisciplinary research institute in Austria are working to uncover how life might evolve with "exotic" biochemistry and solvents, such as sulphuric acid instead of water. Their research will be presented at the European Planetary Science Congress in Potsdam by Dr Johannes Leitner on Friday 18 September. The University of Vienna established a research group for Alternative Solvents as a Basis for Life Supporting Zones in (Exo-)Planetary Systems in May 2009, under the leadership of Maria Firneis. Traditionally, planets that might sustain life are looked for in the ‘habitable zone’, the region around a star in which Earth-like planets with carbon dioxide, water vapour and nitrogen atmospheres could maintain liquid water on their surfaces. Consequently, scientists have been looking for biomarkers produced by extraterrestrial life with metabolisms resembling the terrestrial ones, where water is used as a solvent and the building blocks of life, amino acids, are based on carbon and oxygen. However, these may not be the only conditions under which life could evolve. One requirement for a life-supporting solvent is that it remains liquid over a large temperature range. Water is liquid between 0°C and 100°C, but other solvents exist which are liquid over more than 200 °C. Such a solvent would allow an ocean on a planet closer to the central star. The reverse scenario is also possible. A liquid ocean of ammonia could exist much further from a star. Furthermore, sulphuric acid can be found within the cloud layers of Venus and we now know that lakes of methane/ethane cover parts of the surface of the Saturnian satellite Titan. Consequently, the discussion on potential life and the best strategies for its detection is ongoing and not only limited to exoplanets and habitable zones. The newly established research group at the University of Vienna, together with international collaborators, will investigate the properties of a range of solvents other than water, including their abundance in space, thermal and biochemical characteristics as well as their ability to support the origin and evolution of life supporting metabolisms. 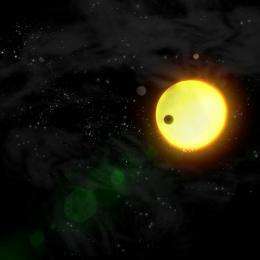 “Even though most exoplanets we have discovered so far around stars are probably gas planets, it is a matter of time until smaller, Earth-size exoplanets are discovered,” said Dr Leitner. I always thought it was illogical to look for life only where there is water. Water is what we know to cause life on Earth, doesn't mean it has to for all life in general. Evolution uses it's surroundings to adapt and strive, maybe we rely on water because it consumes 70% of Earth, Instead of thinking because it consumes 70% Earth, life exists. However from what we know and the few resources we have and considering the cost it takes to even enter space (I can't believe it still cost millions to get up there) we should put all bets on planets with water for now. @ Birthmark, what are you implying by comparing the cost of spaceflight to the cost of earth-based lab testing? Yeah, this is nice research. I believe this is based on Professor Sculze-Makuch's Parameters for Extraterrestrial Life article though..
NotAsleep - Isaac Asimov published something on possible life not as we know it, from very cold to very hot. Although it was written many decades ago, it is still the best short overview of the subject I have seen. I believe it was n "View from a Height".